A formal acknowledgement for cash donations will be sent to each donor upon acceptance of the gift. Each acknowledgement will state the tax-deductible portion of the donation. St. John’s Food for the Poor Program will formally acknowledge noncash gifts in a letter containing a description of the donated item, although the actual fair market value will not be stated. Valuations provided by the donor will be stated as such. Please contact us for up-to-date financial reports. St. John’s Food for the Poor Program is a nonprofit 501(c)(3) EIN 04-2106729 organization, and engages in the solicitation of private gifts and grants that enables it to fulfill its mission to bring together all available resources for the benefit of the hungry in Worcester County. Gifts are sought from individuals, corporations and foundations and are sought only for the purposes of programs that further the mission of St. John’s Food for the Poor Program. St. John’s Food for the Poor Program never uses third-party fundraisers or professional fundraising companies in any capacity to raise funds for our organization. This includes telemarketing (phone calls or emails) as well as engaging in door-to-door solicitations. The program receives $1.00 out of every $1.00 donated to us and 100% is spent on our programs and services. Donors should feel free to contact St. John’s Food for the Poor Program if they have a question about fundraising. Please send your questions or comments about to St. John’s Food for the Poor Program, St. John’s Church, 44 Temple Street, Worcester, MA 01604, email info@stjohnsfoodforthepoor.org or phone 508-756-7165. St. John’s Food for the Poor Program solicits and accepts gifts for purposes that will help the organization fulfill and further its mission. The program urges all prospective donors to seek the assistance of personal legal and financial advisers in matters relating to their gifts, including the resulting tax and estate planning consequences. St. John’s Food for the Poor Program values its integrity. Gifts that may expose the program to adverse publicity, require expenditures beyond the program’s resources or involve the program in unexpected responsibilities because of their source or condition, or are not consistent with the program’s mission, will not be accepted. St. John’s Food for the Poor Program cannot accept gifts that involve unlawful discrimination nor can the program accept gifts that obligate it to violate any applicable laws or regulations. The following policies and guidelines govern acceptance of gifts made to St. John’s Food for the Poor Program for the benefit of any of its operations, programs or services. a) Gifts of securities that are subject to restrictions or buy-sell agreements. b) Documents naming St. John’s Food for the Poor Program as trustee or requiring the program to act in any fiduciary capacity. c) Gifts requiring St. John’s Food for the Poor Program to assume financial or other obligations. d) Transactions with potential conflicts of interest. e) Gifts of property which may be subject to environmental or other regulatory restrictions. 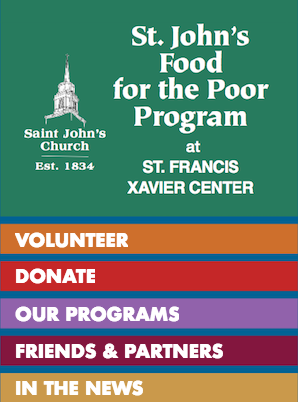 St. John’s Food for the Poor Program will not accept gifts that (a) would result in the program violating its mission, (b) would result in the program losing its status as an IRS 501(c)(3) nonprofit organization, (c) are too difficult or too expensive to administer in relation to their value, or (d) would result in any unacceptable consequences for the program. Decisions on the restrictive nature of a gift, and its acceptance or refusal, shall be made by the Father John Madden, Executive Director and Frank Carroll, Finance Chairman in consultation with other members of the Executive Team. Cash gifts are acceptable in any form, including by check, money order, credit card or online. Donors wishing to make a gift by credit card must provide the card type (e.g., Visa, MasterCard, and American Express), card number, expiration date and name of the cardholder as it appears on the credit card. Noncash gifts valued at $4,999 or less. For noncash/in-kind gifts of $5,000 or more, a qualified appraisal must also be submitted. Marketable securities may be transferred electronically to an account maintained at one or more brokerage firms or delivered physically with the transferor’s endorsement or signed stock power (with appropriate signature guarantees) attached. Marketable securities may be held or sold. In some cases, marketable securities may be restricted, for example, by applicable securities laws or the terms of the proposed gift; in such instances the decision whether to accept the restricted securities shall be made by your lawyer, Father John Madden, Executive Director, and Frank Carroll, Finance Chairman, in consultation with other members of the Executive Team. Please contact us by phone (508-756-7165) or email (info@stjohnsfoodforthepoor.org) to plan for bequests and beneficiary designations. Donors are encouraged to make bequests to St. John’s Food for the Poor Program under their wills, and to name St. John’s Food for the Poor Program as the beneficiary under trusts, life insurance policies, commercial annuities and retirement plans, as allowed by the plan provisions. St. John’s Food for the Poor Program will accept designation as a remainder beneficiary of charitable remainder trusts. St. John’s Food for the Poor Program will accept designation as an income beneficiary of charitable lead trusts. The Development and Fundraising Committee shall review and determine whether to accept any gifts of tangible personal property in light of the following considerations: Does the property further the organization’s mission? Is the property marketable? Are there any unacceptable restrictions imposed on the property? Are there any carrying costs for the property for which the organization may be responsible? Is the title/provenance of the property clear? St. John’s Food for the Poor Program will accept gifts of life insurance where St. John’s Food for the Poor Program is named as both beneficiary and irrevocable owner of the insurance policy. The donor must agree to pay, before due, any future premium payments owing on the policy. All gifts of real estate are subject to review by the Development and Fundraising Committee. Prior to acceptance of any gift of real estate other than a personal residence, St. John’s Food for the Poor Program shall require an initial environmental review by a qualified environmental firm. In the event that the initial review reveals a potential problem, the organization may retain a qualified environmental firm to conduct an environmental audit. Criteria for acceptance of gifts of real estate include: Is the property useful for the organization’s purposes? Is the property readily marketable? Are there covenants, conditions, restrictions, reservations, easements, encumbrances or other limitations associated with the property? Are there carrying costs (including insurance, property taxes, mortgages, notes or the like) or maintenance expenses associated with the property? Does the environmental review or audit reflect that the property is damaged or otherwise requires remediation?